I appeared on Brad Friedman’s BradCast today with Heather Digby Parton. 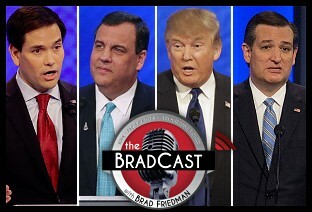 We discussed the Saturday night Republican debate and the state of the race, generally. It was pretty fun to finally get to talk to Digby who, as you probably already know, is super smart and very incisive. And Brad’s a great radio host who is very easy to work with. Hopefully, you’re already familiar with his tireless work to make sure we have accurate and fair elections. You can download the show here. It runs about an hour and it will be broadcast on a number of radio stations, including KPFK 90.7FM (Pacifica Radio, L.A.) · KTNF 950AM (Mnpls-St. Paul, MN) · WLRI 93FM (Lancester, PA) · KAKU 88.5FM (Maui) · KYAQ 91.7FM (Newport, OR), and · KSOW 106.7FM (Cottage Grove, OR). It’s also streamable on Progressive Voices · Radio Sputnik · Indie Media Weekly · Netroots Radio · Radio Or Not · FYI Nation · Radio Free Brooklyn · Stitcher · TuneIn, and · iTunes. If you like progressive radio or just want to find out what I sound like, make sure to check it out.